A score from the local charity shop. 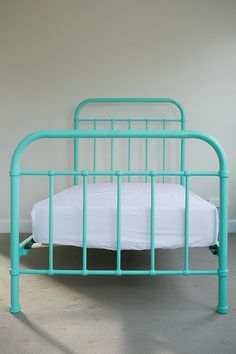 A single size wire bed frame, with a tubular steel head and foot. It had a scratched up white surface, marking it clearly in the early 00s, of the current century. With a touch of alchemy I turned it into forge hammered copper. The spray can of hammered chestnut gave out half way through the bed head frame, which I did as the last section. I didn't feel up to another trip into town so decided to try the dregs of and old rose copper spray. It ran out just as I finished. Touch wood the metallic paint holds. Very nice, Hurricane - will look lovely with one of those older style chenille bedspreads! I have a very narrow single bed from my Nan's house. The slightly arched base is very 1920s, or 1930s depression era steel, and the ends are cheap & tatty chrome replacements from the 1960s. I am thinking they were originally wrought or cast iron like my own bed-ends, but replaced in the 60s when my uncle & his family lived in the house. I am thinking it may be difficult to replace them, but I just may start looking. Otherwise, I'll be looking for the metallic paint, but will use automotive spray paint - it may be more durable! That's a nice chair you have skulking in your shed, too! The chair id's an old cane piece that has had the springs go on it. I may get round to putting a piece of plywood in it. I have a lowboy (depression era cheap), with cedar shelves, the bed as mentioned, and, more recently, after my aunt died, my grandmothers bookcase. Originally I had two beds, but gave one away to a needy neighbour with children. On the other hand, my first look on e-Bay found a narrow (but not the same size as mine!) 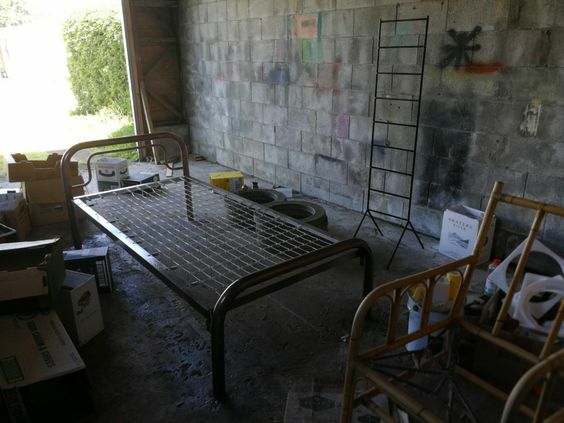 single bed, with wrought iron ends, in the same tiny town in which I live!, for which I will make a decidedly cheeky offer of $50! After all, he did get the bed for nothing, as I know where it came from, had first dibs on it, but it was given away by the hubby of the lady to whom I had offered first dibs!! 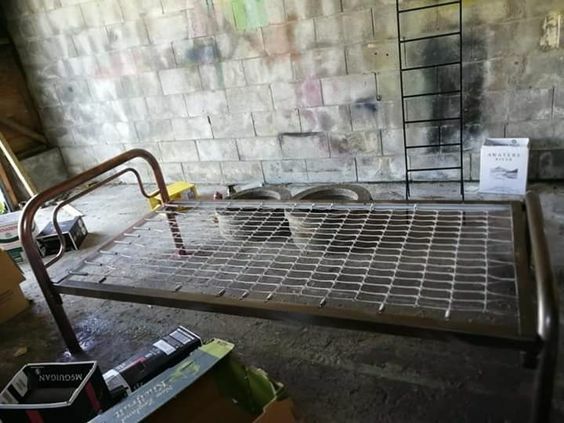 If I can get that, I will forgo looking for other bed ends, and perhaps see what can be created with copper or brass pipes, and joints, then painted. Or I will just tart it up with paint! A quirk of fate to find that bed online. Would they all come from the same manufacturer, and from the same store back Inn the day? No, not from the same place, I wouldn't think. Mine is fractionally narrower, the bed base is constructed differently, and the way the chrome ends are attached to the base is different - rounded sides, and the mesh is wired wrapped around the round sides. Bit of a bodged-up job, as was often the case in rural NSW depression years. The one I have my eye on is much older, with L shaped steel pieces - the steel-wire woven bits are attached to the side pieces with hooks, like yours, so I think it is a replacement mesh - the side pieces are original. There is only one bed, although the add says two. Its a very nice piece. The ends do have s special charm. It probably will be a " newer" wire wove after all this time. There are modern imitations , though they do not have the style or shape of the originals. Low quality metal and too many short cuts in the designs and details. My own, personal bed is 99% original, even to the heavy timber constructed base, with adjustable tension for when it stretches a bit, (reminder to self - get the spanners out & tighten up half a turn!) woven steel wire (rust & all in some places!) and wrought iron sidepieces and ends. It's an old 3/4, Victorian era, which means I can't get fitted sheets to fit, so I use double flats. Also, when getting mattress replacements, suppliers kept thinking I was after a king single - width is right, length is 6 inches shorter than a KS. Finally got it right! Nice and high off the ground, too, so easy to get in and out of! Just love it - nothing more robust than wrought iron! The only thing not original is the paint job on the iron. It was originally black, but now it is forest green. Now that's a bed! I'm predicting bed sizes will come back down again as rooms get smaller and folk minimise their lives. Many single folk and new couples are opting for single beds. The novelty of queen and king beds, large beds for children, will wear off. The trend was based around a clever sales marketing ploy and status. purchase choices. My visitor's choices include the old single (it's the one with the electric blanket! ), a double sofa bed in the back room, or a 3/4 foam sofa bed in the front sunroom! There is also a fold-up, an old former garden lounge turned single, the lounge itself, or a mattress on the floor - multiple choice, with a vengeance! However, mine is the best! And is probably the only truly Steampunk item in the house - Oh, I forgot, I do have a Vicwardian dressing table, in mahogany! I'm jealous you have a sunroom. I have plenty of rooms. I didn't have beds. I have a long narrow house reminiscent of a dormitory. People assume it's 2 rumpty old flats. I suspect it didn't have s former glory to restore it to. The building is in fact 2 dwellings cobbled together. The original part being the back of a former corner shop and the other main dwelling was transported from a former military camp. One end is wood, the other fibro weatherboard. Both being painted contrasting colours. The only saving grace is that they are from a similar era, pre ww2, and share a common style of the period. My mission I have chosen to accept, is to give it a cohesion and lending it the air of a single residence. It won't be a quick paint job. My sunroom used to be the front verandah, which was too hot to use in summer, and too cold in winter. It is now a beautiful little room the width of the old verandah, and almost its complete length. Took a "bite" out of the front to create a small storm porch and to relocate the front door forward a metre. So there is a small internal lobby space, and the sunroom itself, which is long 2m wide and 4-ish m long. It was created to fit a canvas awning from another window now protected by the roof over the deck. Fortunately, it was the exact length to fit the width of the verandah! I have what used to be a square house, with 2 bedrooms, & a front and back verandah on which was placed the laundry & the loo! The second owners added a 4x4.5m triple bedroom on the back to rent out to fellas working on the big dam up the road, and built in the back verandah, creating a small, light lobby. My renovations have tarted the place up somewhat, as I remodelled the laundry and installed a shower, to create a second bathroom/laundry, turned the bathroom into a shower/wet room with loo & handbasin, and built a large deck out the back, with ramp, so that I didn't need to lug wood up stairs. The whole house and deck, with the small exception of the old front door step, is now all on one level. With the carport now extended to the front of the house, fence and gates extended and moved, and a new window in my office I have finished the building phases of the house for now. It needs a paint, but that will have to wait upon finances, I'm afraid! There's no "former glory" in a weatherboard box, either! I would like to clad it in stone, though and have a stone cottage! Your description brings to mind the older homes in Perth inner suburbs. Porch out the front, often concrete with pillars and wash house / toilet out the back. Built in back and front porches were common. 2 places I stayed in, my room was a covered in back porch with louvered windows. One had bedroom windows and concrete exterior walls running along the interior.